Whenever I ask Nick what he wants me to make for dinner (or lunch), 9 out of 10 times his answer is chili. 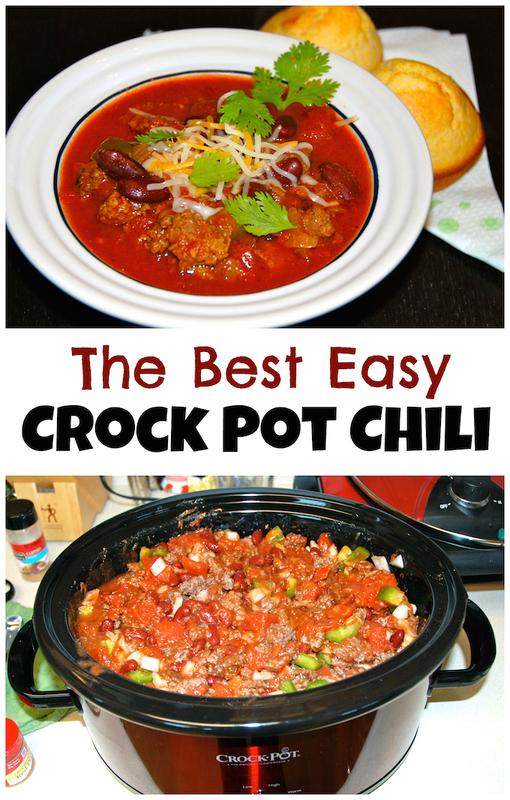 I’ve made a zillion chili’s, but since I only recently got my Crock Pot, I’ve never made a slow cooker chili! So this weekend, it was time. If you missed yesterday’s post, be sure to click on over to check out the sweet giveaway. You can still enter until tomorrow morning! So, the chili. Usually I try to do something different and creative, but this recipe is pretty straightforward. Unless you’re one of those weirdos from Cincinnati who doesn’t consider this chili because it contains beans. And isn’t served over spaghetti. 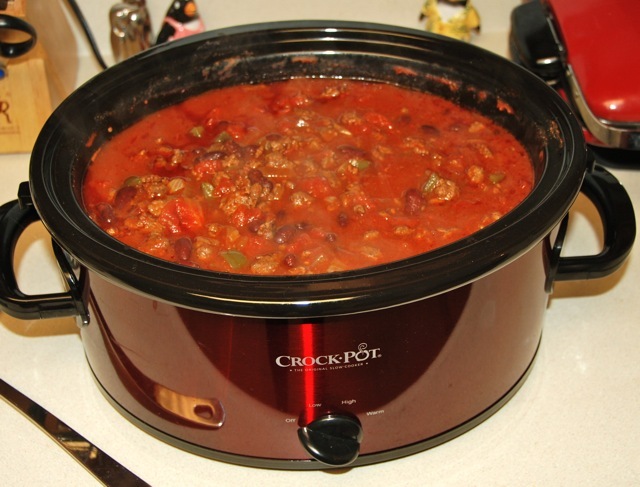 To me, chili means beef and beans and maybe a couple veggies like peppers and onions. That’s what I’ve got goin’ on here, but it’s 100 times better than the kind that comes in a can, and not much more difficult. Brown the meat in a skillet (in batches if necessary) until fully cooked. 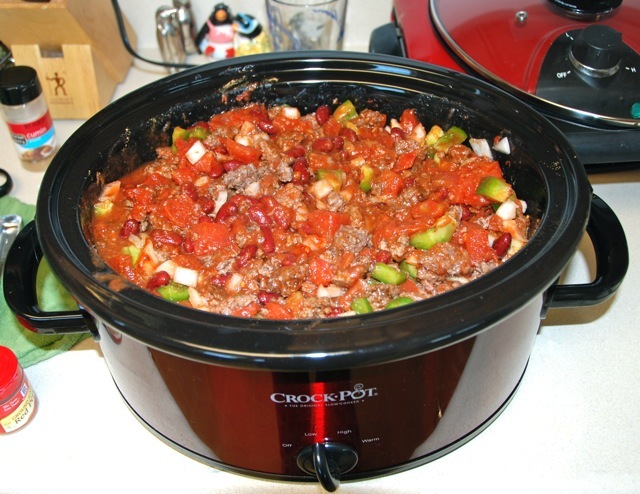 Drain any excess fat and transfer the meat to a crock pot. Add all the other ingredients and stir to combine. That’s it! Super easy. 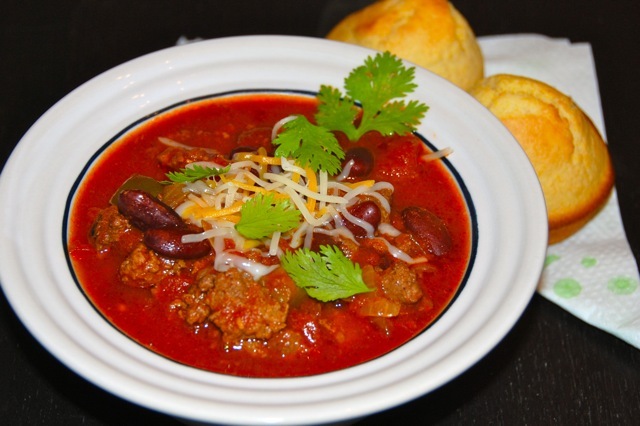 Serve the chili with cornbread, and top with cheese, sour cream, cilantro or green onions. The chili was great. Nick claimed it as his favorite thus far. But he says that every time I make a new one. So either he’s just being nice, or I just keep getting better! Although… there was a lot more meat in this one than any of the others I’ve made. So maybe that explains it. Two days ’til I leave for vacation. That’s really all I’m thinking about right now. Soooo… loveyoubye!